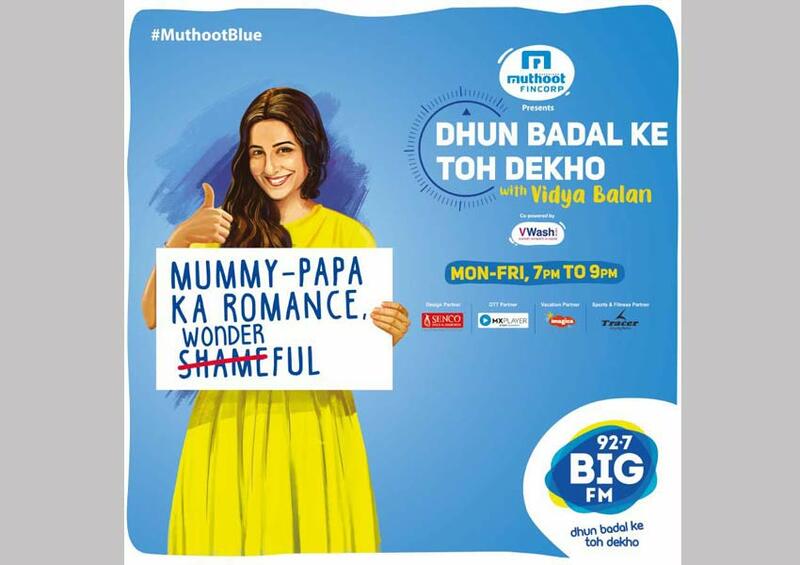 BIG FM’s highly-anticipated offering Muthoot Blue presents ‘Dhun Badal Ke Toh Dekho with Vidya Balan’ has been creating headlines for more reasons than one. To begin with, the show is an extension of the radio network’s new positioning ‘Dhun Badal Ke Toh Dekho’ which urges people to think differently. Moreover, its innovative launch witnessed Vidya Balan rapping for the first time ever to convey the show’s announcement and messaging. The show has on-boarded leading brands including Muthoot Fincorp as the Presenting partner, intimate hygiene brand VWash Plus by Glenmark Pharmaceuticals Ltd. as it’s Co-powered partner, jewellery brand Senco Gold & Diamonds as its Design partner, MX Player as OTT Streaming partner, Imagica as Vacation partner and Tracer shoes as Sports & Fitness partner. The much-talked-about programme, Muthoot Blue presents ‘Dhun Badal Ke Toh Dekho with Vidya Balan’ will air every weekday evening from 7 PM to 9 PM, with repeats on Saturday and Sunday from 5 PM to 9 PM across HSMs. A special highlights segment named Muthoot Blue presents Dhun Badal ke toh Dekho with Vidya Balan – SPOTLIGHT, will be aired across Monday to Friday between 01:00 PM to 02:00 PM. The show will focus on bringing relevant social topics to the fore and spark positive conversations and change redundant perceptions in society. Amplifying innovation and creativeness in programming, the episodes will take up topics ranging from mental health, domestic violence, new age parenting, adoption, body shaming, child abuse, bullying and more. In conclusion, the show will recognize exemplary stories of real-life people who have changed the way the society thinks and behaves, to inspire the listeners. The show will also introduce Reporter Kaviraj as an interstitial, curated basis various topics discussed on the show. The interstitial intends to provide a lighter take on subjects and encourages drawing room conversations on tabooed topics. The episodes will also witness special celebrity chat segment where they will indulge in an up-close conversation with RJ Vidya Balan around the topic. Every Friday, Vidya Balan would be discussing interesting elements from her films connecting it back to real life instances. Empowering human ambition is presenting partner Muthoot Fincorp’s brand philosophy. BIG FM’s upcoming show ‘Dhun Badal Ke Toh Dekho with Vidya Balan’ affirms the same sensibilities which made Muthoot Fincorp to partner with the radio network for the show. Brand VWash Plus offers a progressive, expert intimate hygiene solution to a prevalent need felt by women today. The show seeks to add a much-needed dose of positivity around contemporary issues and obstacles faced by the society making it an obvious choice for the brand. Moreover, the show’s novel concept makes Senco Gold & Diamonds an apt partner, since the trusted online shopping destination has also successfully changed people’s perceptions towards shopping for precious jewels online. On the other hand, as a part of the association, the rap song by Vidya Balan along with her monologue videos will be available for the large viewer base of MX Player which is India’s leading streaming platform. BIG FM will also have a special segment for MX Player every Friday. Moreover, reiterating the importance of vacation and living a healthy life brings Imagica on board as Vacation partners and Tracer shoes as Sports & Fitness partner.